Gargantia on the Verdurous Planet: Urobuchi Indoctrinated Youth with Social Commentary! One of Gen Urobuchi's works, not much to be said. But the Title's flashy. Like seriously, I didn't know Verdurous was even a word. A new word at that. To put in a review, short and sweet, Gargantia is a sort of political and social commentary directed at Teens and those in their early 20's. Gen Urobuchi stated that the intent of the anime would be to convince the youth that "going out into the world isn't scary". You can definitely see it in the anime as the opening and ending songs are especially tailored to this theme. But yes, the political and social allegories that run throughout the series are impactful in this anime, and it is because of some of the dark twists that come up in the series. So don't believe Gen Urobuchi's words, and enjoy this short anime knowing that you can make connections to its content and the real world. More specifically, the social commentary is heavily influenced by observations on socialism, fascism, racism, wars, and blind obedience (as if we haven't seen that in anime enough). I'm tempted to draw a fictitious line between this series and animal farm, as the bad guys often reminded me of the Soviet Union. More or less, I feel like the message that Gen Urobuchi tried to leave was to tell youths to question their upbringings and make decisions for themselves. It's in part a social commentary, but also a coming-of-age story that focuses on challenging ones own beliefs as an individual. The main cast was filled with youths who mainly struggle to fulfill the roles that they were either given, or that they believed they had to fulfill. The characters were easy to follow for the most part, and the main cast is all likeable enough to help the story flow. I came to like the main cast a lot, even if some of their personalities were bland and a bit cliche to fill in certain roles in order to keep the plot progressing. The character designs had a refreshing style pinched into them, and everyone's character growth and development really nailed the message of the anime. I'd like to say that this anime was flawless. The production went smoothly and was enjoyable, but that's it. Just because it has no major flaws, doesn't make it an amazing work. It doesn't have that in your face action that something like Gurren Lagann has, the emotional impact in Clannad: Afterstory, or the depth that exists in Fate/Zero. It was a fairly underwhelming piece, despite it's clean execution. A well paced, well thought out, and overall well made anime. But, it's because it stops there and doesn't try to be anything more that Gargantia will never go down as a masterpiece. So if you're looking for something that is meaningful; if it's an anime that's not too light, but not as dark as Gen Urobuchi's previous works, then chances are, Gargantia on the Verdurous Planet is for you. Ok so to start this anime seems awesome. I like the whole premise of it and the animation and art are awesome. It has been a while since I have gotten excited over something and this definitely has promise. Excellent Anime from Start to Finish! At the beginning it was hard to understand the concept but after 10 minutes everything was interesting. A different way to view the concept of humanity. You get to love these characters from start to finish. 5 out of 5, Great Series! The story begins in the distant future in the far reaches of the galaxy. The Human Galactic Alliance has been constantly fighting for its survival against a grotesque race of beings called “Hideazu.” During an intense battle, Ledo and his humanoid mobile weapon "Chamber" are swallowed up into a distortion of time and space. Waking from his artificially induced hibernation, Ledo realizes that he has arrived on Earth, the planet on the lost frontier. On this planet that was completely flooded by the seas, people live in fleets of giant ships, salvaging relics from the seas’ depths in order to survive. 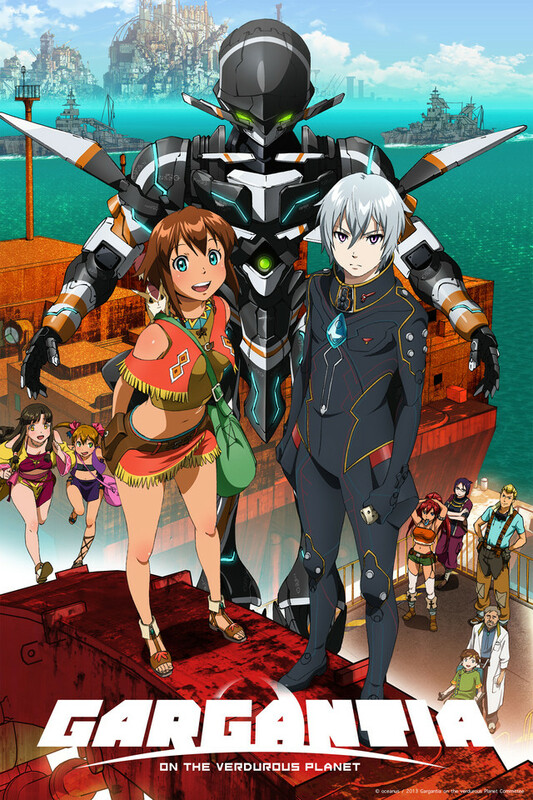 Ledo arrives on one of the fleets called Gargantia. With no knowledge of the planet’s history or culture, he is forced to live alongside Amy, a girl who serves as a messenger aboard the Gargantia fleet. To Ledo, who has lived a life where he knows nothing but fighting, these days of peace continue to surprise him and this is the beginning of a great Anime!!! I officially can no longer place any faith in online classification and synopsis writing of anime. In particular, this one fell way outside of my usual genre interest. The synopsis, as usual, was poorly written and an immediate turn off. But, after watching a long string of good anime whose summaries had initially deterred me, I decided to watch this one based on the promising art work and good faith. Needless to say it was the right call. The first episode immediately had my attention, and four and a half hours later I had finished watching one of the finest short anime I have ever seen. In only thirteen perfectly paced episodes Gargantia manages not only to tell an incredibly unique story with compelling characters, but deliver a series of heart stopping, (but more importantly sincere and devoid of cliche), twists. While I hope there is a possibility of a second season, it only goes to show how well written it was that it could end with a feeling of genuine, satisfying closure with so little run-time. I'll be purchasing this as soon as possible. Production value and excellent writing! I've been watching anime a long time, and this one has me REALLY intrigued. In terms of pilot episodes that can get you hooked on an anime, this one has it all. I thought it was going to be an average mecha-anime, but that's not even the focus at all! I would definitely pick this anime up to watch! "Grab the popcorn. If you ever wondered what a fox in a henhouse looks like, you're about to see." However, that's not what happens (Okay, there's a lot of that in the original Gundam Wing and a bit of that in Full Metal Panic.). After initially clashing with the civilization, GW type pilots meet girls, moderate their views, and (to varying degrees) become more civilized. Much like White Fang is to Call of the Wild, the Gundam Wing style of character development is the opposite of Gundam 79 style character development. Rather than receiving a giant robot and becoming accustomed to war as in 79 style anime, GW type protagonists start out with the robot and are accustomed to war. They have to become used to peace and the absence of said robot. It is a story about civilizing a wolf (White Fang), rather than a story about a dog turning feral (Call of the Wild). Note: Admitedly, Sagara and Heero Yuy are still wolves to the end, but they are markedly less feral than they were at the start. I like Gargantia more than most GW style mecha, probably because it focuses on Ledo's character development rather than filler and because most of the characters are more palatable than the usual gundam fare. Gargantia takes the GW style of character development much further than the others by removing Ledo's purpose, forcing him to reevaluate his life in ways that neither Sagara nor Heero Yuy had to do. This process changes him for the better and, while he has some relapses, his new ideals prevail when he is confronted by his past during the ending crisis. This is in contrast to Heero Yuy, who would probably have put a bullet in Relena (his sorta kinda girlfriend) if Operation Meteor called for it. Gargantia further distinguishes itself with Ledo's sentient mobile suit, who in many ways steals the show. He serves as Ledo's friend, mentor, and weapon of choice. While he often serves to argue a crueler counterpoint to many of Ledo's new views, Chambers' development mirrors Ledo's. At the end, Chambers shows that he is an intelligence built in the image of man; capable of understanding morality and performing acts of heroism. It is a rare thing to see a mobile suit change with his pilot, though that has been done before on our side of the pacific with The Iron Giant. + Very sound use of GW style character development. + Generally optimistic view on humanity. + Music is more Haloish than Bungie's soundtrack for Halo. - I almost expect more from Gen Urobuchi. At 1st I was kind of hesitant to watch because I don't really like shows with mechas but this one seems like its going to have a good story it also reminds me a little of vandred but the animation is great they put a lot of work into it. I can't wait ton see the rest of the series! Good show, good story, complete arc. Animation is nice and clean, typical of the modern styles. It isn't anything artsy or spectacular though. Music is blended well with the show, but I'm not buying the soundtrack. Characters are pretty well done for a 13 episode show. There was not time for a great deal of depth, but all the major characters had personalities and traits that stood out. They were definitely not flat. The story was pretty good. Everything got crammed into 13 episodes without feeling rushed (a challenge that many shows fail). There was certainly some ideology and some moral to the story as well as a conflict that made sense for the most part. There is more to the show than just alien killing robots. So overall I really enjoyed the show. It was not a masterpiece, but it is a really good show. It is entertaining with likable characters, a good story, and good technical execution with several really cool moments. The animation is amazing and the characters are all lovable. It has a strong story and a large amount of smooth character growth. The storyline is not entirely unique (reminds me a lot of xamd) but is still very refreshing and compelling. Easily the best show of its season and will keep you wanting more even after its over. Wow, That's all i have to say, WOW. At first, i thought this was going to be your typical Mecha Anime and blah; and boy was i wrong! The first 10-15 mins might not get your attention because it feels like any other space mecha anime but then boom, it suddenly grabs your attention. I'm not going to spoil anything but when the main protagonist "Ensign Ledo" gets sucked into a guess a worm hole and ended up on earth, it completely changed the way i thought about this anime. I love the Anime style and artwork of gargantia. It feels like i'm watching a high quality anime movie each episode. Yes, the artwork is amazing, this anime looks incrediblely detailed. The scenery, Gargantia itself, and the characters look great! I think this anime has one of the best water effects out of any anime.